Crack the speed barrier wide open with PSYCHO BONKERS! Join Shine, a young but unyielding teenage girl, as she races to find the true story behind the tragedy that wrecked her family and shattered the sport of Bonk Racing to its core. 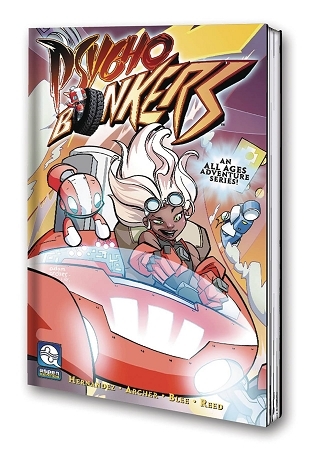 Along with her trusted robot technician, Gabbo, and her sentient Bonk Racer car, Shiza, Shine will discover that learning the truth about her future is as dangerous as the tragic past she is trying to forget! Told in a series of legs within the race of all races-the Super Bonk Rally, this thrilling series spans amazing landscapes and death-defying terrain, as these racers go PSYCHO BONKERS!